This is kind of awesome and horrible at the same time. I have to add that I don’t endorse the Kickstarter campaign this is tied to, but if you’re into performance art, the Marina Abramović Institute is probably your thing. Even if it’s not your thing, the fact that a performance artist can give $1.5 million of out of pocket, as in, a performance artist can have $1.5 million dollars from doing stuff like staring at people at the MoMA, has got to make you question your line of work. With my local comic book shop going out of business (“The kids these days don’t like collecting…”) everything in the store is on a steep discount. I figured it was a great time to discover blasts from the past, and Star Slammers is definitely one of those. Remember Malibu Comics? There were an independent comic book company started in the 1980’s that Marvel Comics later acquired in the mid 1990’s. 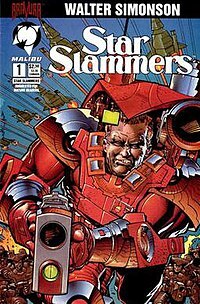 Their more popular titles (Exiles, Rune) were in their Ultraverse imprint, but they had a few gems in their Bravura imprint, including Walt Simonson’s Star Slammers. About a captured space mercenary, the title showcases an outlandish universe of muscle-head aliens, teenage psychics, and scantily-clad, laser blaster wielding vixens. It is awesome. Simonson’s currently illustrating Indestructible Hulk, but his layouts in Star Slammers is much more inventive. If you can find this title in the dusty bins of your comic book shop, get it. It’s just plain fun. MetaMorphosis Reviewed on Graphic Policy! Brett Schenker reviews MetaMorphosis #1 on Graphic Policy! He calls it a “interesting and fun read,” and that “It’s clear Manalo has a great grasp of storytelling.” If you want to know the critical parts of the review, you have to read it for yourself, because I won’t tell you. In a world where the laws of physics are falling apart, the Federal Bureau of Physics is there to respond to your emergency! With Collider #1 writer Simon Oliver (Gen 13) and artist Robbi Rodriguez do a great job of setting up a world where the gravity around your high school might suddenly disappear or a wormhole might appear in the trunk of your car. It’s a great concept where the only rule is that “the impossible is possible.” The frayed edges of existence are well-drawn in a lose and expressive style, and the characters continue the motif with the (familiar) character types of the hard-nose, by-the-book boss, the experienced veteran, and the wild card. This book is fun. If you have an ounce of nerd (enough to know what gravity is supposed to do) and especially if you’re getting tired of so many superhero comics, you will enjoy Collider, from Vertigo Comics. Buy my comic MetaMorphosis #1, now available on ComiXology for only 99 cents! You are currently viewing the archives for August, 2013 at Princess Revolver Media, LLC.